Alberto Perlman is the CEO and co-founder of Zumba Fitness LLC, the largest branded fitness program in the world. The Global Lifestyle Brand fuses fitness, entertainment, and culture into a dance-party experience, and has more than 15 million weekly participants in 200,000 locations across 180 plus countries. Alberto oversees the day to day operations, manages brand and product development, and negotiates strategic partnerships with fitness clubs and organizations around the world. Alberto begins by sharing the long road to Zumba’s “overnight” success. It began in the ’80s in Cali Columbia, where a young dance teacher forgot his music and all he had on him at that moment was a cassette tape of music that he had recorded from the radio. That same day Beto, as he is now known, instead of sharing his mistake, told his class, “today we’re going to do something different.” He improvised, the people loved it and that was the starting line, yet it was going to be a long time before Beto and Alberto Perlman crossed paths and the Zumba that we know today was born. Beto worked hard and became one of the most popular instructors in Cali, Colombia. After conquering Cali the next path was to go and create his success in Bogota. After he proved himself in the big city, Beto decided to come to the US as he felt there would be more opportunity for him and he was determined to spread the joy of movement. Beto sold everything and made the move to the United States, but he couldn’t find a way to get started teaching. It took four times of flying back and forth between Columbia and Florida before he finally got an audition at a local gym in Miami. Before meeting Beto, Alberto was doing internet startups and then came the dot com bust. Without work, and over dinner at the house of his parents he heard about this new fitness instructor. His uncle, his aunt and everybody at the table were talking about Beto’s class. His mom had the idea that Alberto should meet Beto to see if they could start a gym together. While Alberto certainly wasn’t thinking about starting a fitness based company, he was also at a low point and willing to explore all possibilities. And so the next day he arranged to meet Beto at a local Starbucks. Over coffee, Beto shared his life story. Alberto saw that Beto had so much depth to his story that believed that he must also teach an incredible fitness class. So he went to see him teach. While Alberto didn’t know anything about fitness, he knew that when you’re doing fitness, you usually don’t smile. But every single person in that room was smiling and drenched in sweat at the same time and Alberto knew this was a magical moment. After the class, he told Beto that he thought he should make some VHS workout tapes. And so with no money, a dream and a handshake a partnership began. Alberto was fascinated by the success of Tae-Bo as the founder Billy Blanks had no connections at the time, but he created some tapes, launched an infomercial and sold directly to the consumers with great success. He saw that it wasn’t about who you know, it was about creating a great product, creating a great TV commercial, and then letting the work speak for itself. They started raising money in May of 2001, and by September of 2001 they had commitments to fund the infomercial, but then September 11 happened and everybody pulled out. In November of that year, through connections, they were able to land a meeting with the company Fitness Quest in Ohio and a deal was made. Alberto gave the rights to DVD’s and VHS tapes, but not to any live products, which looking back was a very good move. Alberto shares that through challenging times, the thing that kept them going where the stories. People would come to him and tell him that their Zumba class changed their life or that someone was able to deal an illness because their Zumba class was their mental break, or that someone was able to have the courage to get a divorce from an abusive relationship because of motivation and friends that came from the Zumba experience. He saw that the magic came in letting yourself go, enjoying your life for one hour, and then by not thinking about anything else, it gave them the strength to do other things in their life. Alberto realized there was a responsibility that the company needed to keep, and that was trying to get as many people to experience Zumba as they possibly could as he realized the workout was really going to help people both inside a class and out in their day to day life. At the beginning, they were just trying to pay the mortgage, but down the line, he saw that there was something much bigger developing. That they had a chance to change people’s lives, and he knew that not a lot of people get a chance to do that. 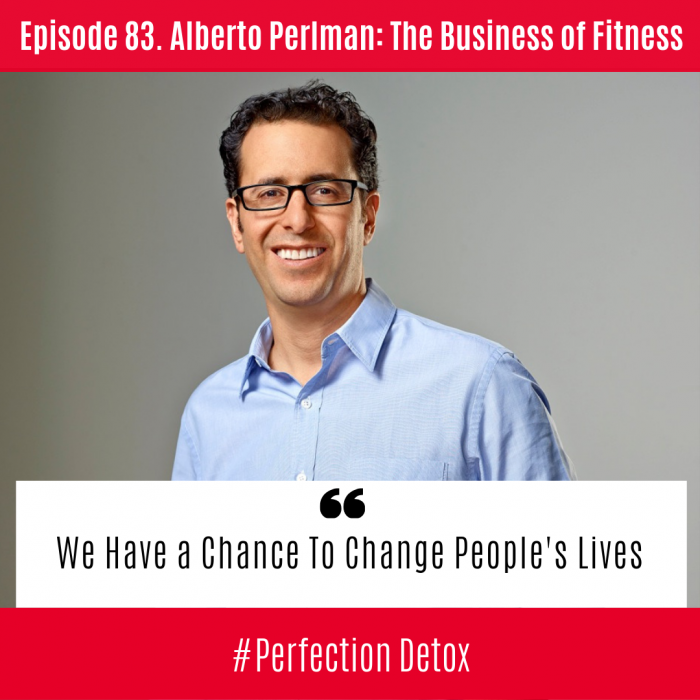 Alberto shares how they expanded from just being an infomercial product to then offering live classes in gyms everywhere. It began when people started calling the infomercial call center asking where they could take a local class? So many people began asking for the live experience that they decided to create an instructor certification. They sat in their garage (office) and with outside expertise created a methodology that could be replicated. In March of 2003, they had their first training. While they expected 20 people, 150 people flew in from all over the country and that was the beginning. Alberto shares some of the challenges that come with such rapid growth, including quality control and the question of when somebody gets trained in Zumba, will it be a certification (pass/fail) or will they let people train and let the market decide? They went with the latter. Getting Zumba into the clubs was not easy. While the smaller clubs jumped on Zumba, it would be a couple of years before the big box clubs got on board. But eventually they did and now Zumba has an amazing relationship with every major gym chain in the world. To this day Zumba is one of the top three classes in every major fitness chain. I then ask Alberto about Zumba Gold, as my mentor Joy Prouty along with Josie Garner where the brains behind this arm of the Zumba brand. Alberto was at a trade show when Joy Prouty approached him and shared how she loved Zumba, but that when she taught classes to the older crowd some of the moves were hard for them. She asked if he would mind if she and Josie created an adaptation for the senior population and Zumba Gold – again over a handshake, was born. Alberto shares how it’s been amazing to watch the growth with success stories such as one of their students being 104 years young. Beto always said music was 70% of the class and so over the years Zumba has expanded into a lifestyle brand. Around 2008 they met Pit Bull at the Grammy’s. He realized that a Zumba class was just like a radio station and a phenomenal way for him to get his music heard. That was the beginning of Zumba creating a really good win, win relationship with artists and expanding into an entertainment brand. We wrap up the conversation by Alberto sharing a life lesson that he gained from the fitness industry. He explained that in the fitness industry you get instant feedback. When you’re standing in front of a crowd, you have to pay really close attention to the reactions of that crowd. It was this realization that has helped Alberto develop group empathy. Now, whenever he is looking out as he is speaking to a group of people, having meetings or holding conference calls, he tries to understand what the other people are feeling so that he can iterate and improve their experience of that exchange of energy and information. Group empathy – what a perfect place to end the conversation.